Nemo Gould was born to artist parents in 1975, in Minneapolis, Minnesota. Named after the protagonist in Winsor McCay’s comic strip “Little Nemo in Slumberland,” Gould’s work has fittingly evolved to reflect the images and mythology of comic books and science fiction. Parallel to these influences was an irrepressible tendency towards collecting and dismantling anything with moving parts. 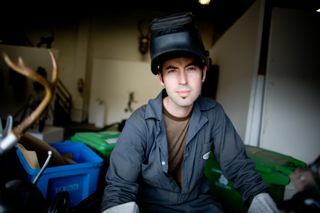 In 2007 Gould was selected as Artist in Residence at San Francisco Recycling and Disposal, Inc.’s Solid Waste Transfer and Recycling Center, an opportunity highly coveted among the Bay Area’s found object artists, who are given free access to the tons of consumer detritus collected daily at the dump. This was a dream come true for the artist who had already spent a lifetime collecting worthless things to transform, and helped to cement his reputation among the makers of his generation. Gould’s work has been featured frequently in national media and is shown in galleries and museums throughout the U.S. and abroad.